Rummikub, the classic game that has been enchanting the world for over 70 years, is reimagined in this superior retro style. The game of Rummikub is deceptively easy. Players take turns creating runs (tiles of the same color in a sequence) or sets (tiles of the same number in different colors) in an effort to use all of the tiles from their racks. Players may also add onto and manipulate runs or sets that have already been played, which makes for exciting and dynamic gameplay that proves why Rummikub continues to be a beloved game night favorite. This elegant set features 106 exquisitely crafted tiles in four vibrant, easy to distinguish colors, four tile racks, and complete instructions that will have your family playing the game in no time. This set is perfect as a first-class upgrade to your beloved Rummikub game, a wonderful set to introduce a new player to the game, or as a beautiful gift for the Rummikub aficionado. This deluxe set includes a beautifully crafted tin featuring one of the very first art designs that helped make Rummikub a household name. Use the tin not only to store the game pieces, but also as a captivating art piece that you will not want to hide in your game closet. 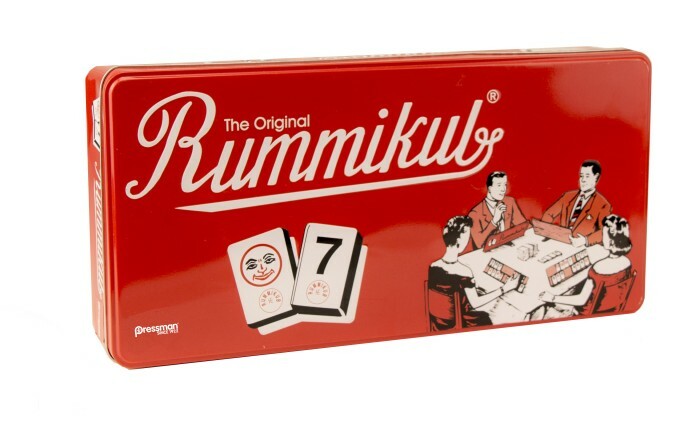 Don’t be deceived by imposters – this is the officially licensed, true game of Rummikub as it’s meant to be played. The quality of this set is incomparable, and will be a treasured keystone of your game collection for years to come.